The European Robotics Week (ERW) is achieving a major success with around 1200 interactive robotics related events across Europe, showing how robots will impact the way we work, live, and learn both now and in the future. Every year the ERW changes the central event and hosts an eco-system of various engaging activities in the chosen location. From 16 to 18 November, Augsburg has been in the spotlight, hosting the Central event of the European Robotics Week 2018 with 1,500 visitors coming to the exhibition over the three days. On Friday, 16 November, ERW2018 started with an Opening, gathering high-level representatives from industry, research, policy and politics, at the Augsburg Town Hall. “The European Commission has been investing in robotics research for over a decade. SPARC, the public-private partnership between the EC and euRobotics, has been particularly successful in bringing together the European robotics community. Europe aims to become world leader in cutting-edge technology and human-centric artificial intelligence (AI). The EC will publish in December a “Coordinated plan on Artificial Intelligence”, developed with Member States so as to address together societal needs such as healthcare, transport or climate change. Additionally, Horizon Europe (the research and innovation program) and the newly-proposed “Digital Europe” programme will address AI. The latter plans to devote about one quarter of its € 9 billion to AI, especially to increase Europe’s capacity in testing facilities as well as in digital capabilities of SMEs through support to digital innovation hubs. We are also aware of the challenges related to robotics and AI. First, there are the ethical issues, like privacy, accountability, transparency, bias, etc. The Commission tasked a High-Level expert Group to draft a set of ethical guidelines on AI by March next year. Stakeholders from all over Europe are invited to contribute through the “EU Alliance platform”, available online. Guidelines will also help address fears associated to robots, very common in the media. The European Robotics Week can also help and show what robots can really do. With over 1000 events in more than 30 countries, we hope that the European Robotics Week will attract young people. It will be their opportunity to choose careers in this field. We need more young people active in these areas. Shortages in skills in engineering, or in data science, risk to block developments and need to be addressed”, explained Lucilla Sioli, Director for “Artificial Intelligence and Digital Industry” at DG Connect, European Commission. From Friday 16 to Sunday 18 November, a robots exhibition, several public talks and activities for adults and children were offered at the Zeughaus. “Automation means more work in less time. Consequently, employment goes down, which means prices go down as well. In response to this, demand raises, and employment goes up again. There is one thing we cannot do: we cannot upload new software to people. We need new people with new skills. This has happened already with the automobile industry, the ATM and computers. This is the automation paradox. By 2030, 47% of jobs could be automated, however 565 million more jobs will be created. Not only are we not going to lose jobs because of robots, but jobs will double. Robots will be man’s best friends in the future”, said Vito di Bari, world’s premiere futurist, innovation strategist and inspirational keynote speaker during his presentation “Robots, AI and the Future – Technology vs. Humanity”, held on 17 November, at Zeughaus. A group of 30 children and 10 teachers from Bosnia and Herzegovina, supported by euRobotics and the British Embassy in Sarajevo, visited Augsburg and the robots’ exhibition. “The Central event of ERW2018 in Augsburg was the very first opportunity for children from Bosnia and Herzegovina to see and interact with real industrial and humanoid robots. For some of them this was the very first visit to another country. The educational trip paves the way for the future organisation of even more robotics events in Bosnia and Herzegovina”, said Maja Hadziselimovic, National Coordinator of the European Robotics Week in Bosnia and Herzegovina. What is happening in Europe? Around 1200 events showing how robots will impact the way we work, live, and learn have been announced so far. Robotics researchers, Universities and Industry opened their doors Europe-wide, from the very West in Spain to Romania in the East, from far North in Finland, to the Southern reaches of Cyprus. In Southern Europe, the Italian Scuola di Robotica is organising over 360 events, and in Spain, 300 events are planned, out of which 190 are in Catalonia. Cyprus is organising over 60 events. In Western Europe, Germany is organising over 130 events, on various topics, with open doors by companies and research institutes alike. In Brussels, Belgium, La maison du livre is proposing some 20 creative events about robots and artificial intelligence, combining cultural, economic, environmental and artistic perspectives. East Europe is focusing on extending access to new technologies for all. In Romania, e-Civis, the organiser of the European Robotics Forum 2019, is teaching the teachers how to integrate robotics in the curricula and has planned some 60 events. Bosnia Herzegovina and Hungary both organise kids’ workshops on programming and competitions. ERW was conceived with the desire of the European Robotics community to bring robotics research and development closer to the public and to build the future Robotics Society. Many more than 500,000 people across Europe have been part of ERW since its first edition in 2011. The European Robotics Week is organised under SPARC, the public-private partnership for robotics between euRobotics and the European Commission. 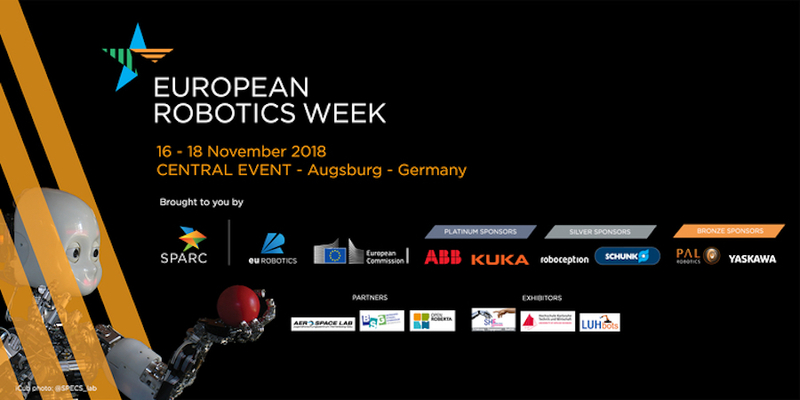 European Robotics Week 2018 (ERW2018) will take place around Europe on 16-25 November 2018.